I always wanted a SUV. Yes.. That’s what I always dreamt of as my car. It had to be. Those brilliant commercials from the Tata stable always left me jaw-dropped. When a Tata Sierra used to step out of its shed all by itself, I used to feel excited. When that Sierra used to dress itself up in slush and mud, I used to feel excited. And then Tata launched Safari. Now, that was THE SUV. Although the first generation had a sluggish petrol engine, its sheer size used to steal hearts. Yes, there were always others who later became “classics”. The MM540 never inspired me as much. Because my encounters with it were always in tourist and pilgrim centres. And being a school-going kid, I was always made to sit with the gear lever slotted between my legs (LOL). I never quite liked the experience. The ride was shaky, noisy. The cabin itself used to feel like an oven. Then came “Armada”. Mahindra had now built their first uber-looking SUV. But, hey! It was all closed. And I always related it to government vehicles. Meanwhile, Tata came out with mind-blowing (or mind-blasting?) TV commercials showcasing Tata Safari Dicor. My heart skipped a beat when I first saw the “Reclaim Your Life” commercial. That was what an SUV was supposed to project – an image of freedom. As more makers stepped into the market with their own SUV offerings, my attention also wandered. I took a liking to Ford’s Endeavour – a massive truck with a fine build quality. The CR-V never caught my attention. It was too soft. The Bolero was rugged but too noisy. The cops had a liking towards it. Pajero was another favourite. By now, I had grown up enough to understand the jargons of automobiles. I knew what to look for in a car, and what not to. Power, torque, engine refinement, handling were words I could relate to. The Safari scored low in handling and refinement. But, it still caught my attention every single time I saw it. The Tatas had succeeded with their commercial. It was in 2011 that I first saw the new jeep in town. It was called “Thar”. I immediately searched online and read about it. It was a true-blue SUV and a true off-roader. It came with a soft top by default. The looks were dashing. It was the classiest of all SUVs in the market. Yet, the reviews said something else. There were issues. Issues that made it a car (yes it’s a jeep) you can’t live with. The interiors, especially, were termed “spartan”. My brother Vijeth bought a Tata Nano in the same year and I learnt to drive properly only then. The Nano was cute, peppy, drivable and fun to live with. I took charge of the Nano when it had clocked 10.5k kms. When we sold it, it had clocked 38k kms. Most of those figures were gained during long drives. I always enjoyed those long drives in it. There were two shortcomings, however. 1. It couldn’t take bad roads. I’m sometimes rash at the wheel. The Nano couldn’t take it. It’s suspension arm gave way to my driving twice in its lifetime. 2. It was not a SUV. Ford came out with EcoSport. On paper, it was an amazing vehicle. It came with all features one could want in a car along with a peppy EcoBoost engine. It was good looking too. It was a good soft-roader. I had started saving up for a car and decided this would be my car. Safari had already taken a backseat as it hadn’t seen good refinement even after spending almost 15 years in the market. 1. When my bother Vikki talked about driving to Ladakh in a hired Innova, I argued that I’d prefer to pay EMIs for my own car. And that if you have to go to Ladakh, it has to be in a Gypsy or a Thar. 2. Pictures of a new Thar with improved interiors leaked online. I waited. EcoSport became way too common. I waited. Specifically for the Thar. The new one. I sold my shares in Accenture and convinced my dad for some amount as a loan. On August 4, I paid India Garage, Bangalore a sum of 3 lakhs as down-payment. The showroom got my loan processed too. The waiting period was supposed to be 1 month. Both Kishan and I were extremely anxious as days passed by. What was supposed to take a month, took almost two thanks to the colour I opted for – Black. 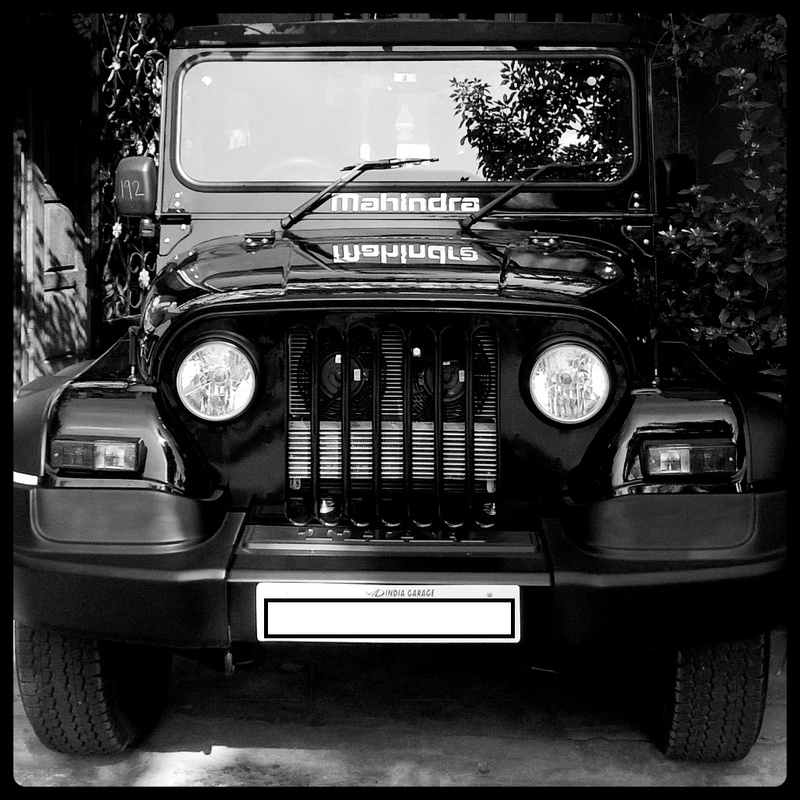 On October 3, 2015, the new Mahindra Thar was delivered to me in the basement of India Garage. On the same day, I drove it down to Kengeri so that my grandfather could perform the pooje. It felt as if a new baby was born in the family. And when a new baby is born, we name the baby – don’t we? This darling was named “Ananya”. And I, sometimes, like to call her “Noor”.